A broken sewer line remains the major cause of sewage and wastewater spill. When this occur, the resulting effects are often devastating, especially on the environment. This was the case of the residents of Goleta and Oxnard, CA some weeks ago. A damage in one of the sewer line in the community brought about a spill of over 2,500 gallons of sewage. This led to the closure of the Goleta beach along the Oxnard Shores. Investigations revealed that the sewer line has been showing signs of clogging, wear and tear. However, it was overlooked. It eventually got broken, spilling untreated sewage into the ocean. For this reason, residents of Oxnard, CA been advised to carry out professional sewer pipe lining services, including inspection and repair on a regular basis. Are you a victim of broken sewer pipes? Since when has your sewer pipes been installed? Have you noticed any sewer leaks in your piping system? The sewer pipe lining technology has made it possible to install new pipes into the old pipes. Within a couple of hours, new sewer pipes will be installed. The best part is that they are very affordable and can last for over 50 years. All that is needed for new sewer pipe lining is only a single entry point. This can be done by digging a small access hole right outside the building or from the roof top. Sewer pipe lining technology eliminates any need for excavation. There won’t be any need to excavate your landscape before new pipe liners are installed. In addition, these new inner pipes are cheaper and cleaner. The installation will be completed within a short period. The sewer pipe lining technology has a lot to offer for your Oxnard, CA home. Now that you are aware of the benefits of sewer pipe lining for your Oxnard, CA, home, guess it’s time to make the move. 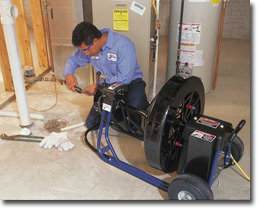 In case you are in search of a reliable company to handle all the processes involved in your sewer pipe lining, including installation, repair, and replacement, Roto-Rooter is the perfect company to get the job done. At Roto-Rooter, our team of competent, highly experienced, well-trained, sewer pipe lining experts are capable of handling your sewer pipe lining project with high level of professionalism. We use innovative tools and ultramodern equipment to ensure that everything is done to perfection. We have been recognized to offer high-quality sewer pipe lining services to the people of Oxnard, CA and surrounding communities. Get In Touch With Roto-Rooter Ventura! You have no reason to wait till your old sewer pipes totally break down before considering pipe lining. This might be one of the best decisions for your Oxnard, CA home and the entire community for years to come. Get in touch with Roto-Rooter Ventura for your sewer pipe lining projects. We are always available to fix any issue and ensure that your sewer pipes and your entire piping system is in proper working condition. GET A FREE PIPE LINING ESTIMATE!